After his studies of sound engineering, vector-size has been working in the audiovisual sector for the last 10 years. He codes any type of media format output like multimedia applications, installations or database driven engines for the web. His work is often based on the influence of signals through peripherals and interfaces in the software domain. 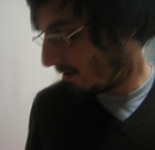 vector-size's music is the result of pushing the software capabilities to its limit, often composing with musical instruments and real life sounds. By putting aside rythmic patterns and sequences, vector-size structures his pieces around the inner timing of the sound itself. He lets the sounds nature lead to the main result of the process to finally drive what seemed like unordered data structures into melodic results. Some of his work have been released with the labels Foehn Records, plataforma-ltw, post.disco, miga-label or rain music. The core of his compositions are now focused on the dialog between movement and sound in contemporary dance choreographies and installations.